Bloggers who invent and inflate "controversies" and "scandals" for Apple are increasingly achieving the opposite of what they are setting out to do. A pattern is emerging where YouTube videos that try to attack Apple's latest iPhone really just direct more attention to it, reminding people outside of the world of tech blogs that there's a new iPhone on sale. 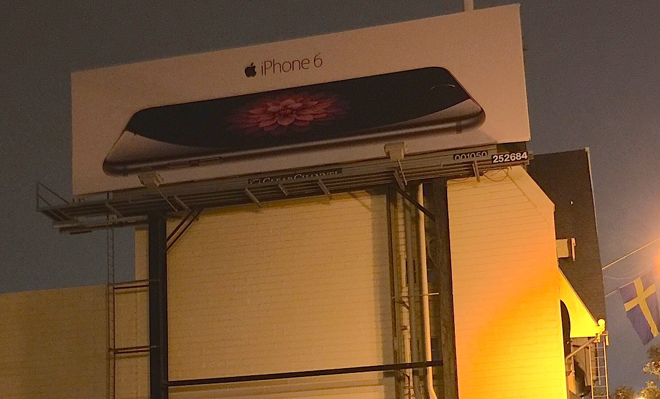 Apple began advertising iPhone 6 and the larger iPhone 6 Plus in billboards and magazine ads that depict how large the phones' new screens are, but the company didn't really advertise how thin the new models were. For that, the company can thank Google's YouTube, which freely promoted the dubious "BendGate" video showing a man destroying the $750 device with his bare hands. The man in the infamous video has large hands that make the expansive iPhone 6 Plus look both reasonably sized and remarkably thin. As he flexes the device from both ends with enough pressure to drive the blood out of his thumbs and inflame his fingertips, his pre-bent iPhone bends even more. Who would have guessed that were possible? Observers on Reddit were quick to call attention to the editing of the video, which supposedly portrays the phone as being bent in one sitting but actually shows the clock jumping back and forth, resulting in a contrived timeline that raises more questions than simply "can one destroy expensive gear?" Samsung experienced similar scrutiny for an ad it produced that depicted its flagship phone undergoing an "ice bucket challenge," with the same kind of problematic timeline. The questionable spot not only portrayed Samsung as feeling threatened enough by the iPhone to take jabs at it (rather than being confident that it actually has the "next big thing") but also made Samsung look dishonest and called into question whether its water resistance feature was even real, rather than focusing attention on its novelty. BendGate is specifically directing the attention of millions of people (36 million views so far on YouTube, paired with mentions in every newspaper and on every local TV newscast) on the exact feature Apple wants to promote about its latest iPhone models: their larger screen size and thinner body that makes them still quite easy to use with one hand. That's a level of incessant, mainstream promotion that would be difficult to orchestrate and bankroll, even for Apple. The negative aspect of the BendGate report actually gave Apple the opportunity to show off the engineering efforts it puts into stress testing its products. Had Apple just put that information on its website, few would have actually seen it. Samsung has repeatedly demonstrated how difficult it is to get people to talk about whatever it wants to sell. From the circus themed Galaxy S4 launch that had people talking more about the embarrassing, sexist production than any notable features of the phone, to the flop launches of its G5 successor and a series of smartwatches that bizarrely run different operating systems, Samsung is spending lots of money on marketing and promotion that fails to communicate much apart from the company's incompetence. Specific to BendGate, Samsung aimed to mock Apple in a tweet portraying the "Galaxy Note Edge," a stylus-driven phablet with a secondary display running along its edge. However, Samsung Electronics President DJ Lee told Ars Technica that the model was simply a "limited concept" that won't be put into volume production. 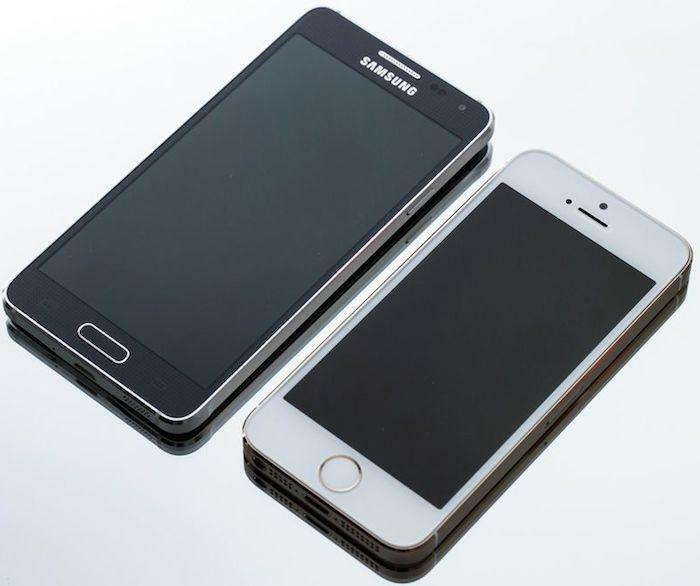 The products Samsung actually sells are already being beaten by last year's iPhone 5s. With new, larger iPhone 6 models now hitting the market, one Samsung executive reportedly acknowledged that "the positive reaction from consumers to those two Apple devices" forced the company to rush its Note 4 launch ahead of schedule, adding "it's true that we are being challenged and pressured amid a difficult situation." The company also redesigned and scaled down its poorly performing Galaxy S5 to look as identical to Apple's iPhone 5s as possible without actually featuring Touch ID. It literally puts Samsung's name on Apple's work. The Verge noted that the now smaller 4.7 inch "Galaxy Alpha" gains greater usability but is saddled a Pentile display that is "noticeable worse" than Samsung's own phones from 2010, and simply "collapses when it comes to color accuracy." "Samsung desperately wants to be part of the design conversation," the site added, "but it still has some catching up to do when its latest phone is more comparable to the handsets of last year than today." Faced with such a scathing factual review of its engineering choices, it seems Samsung would rather be responding to some clownishly overblown criticisms that its products can be broken by men by big hands. After all, it's a lot easier to hear a crazy person tell you that you're a space alien than to hear a doctor tell you that you're just too fat. LG is struggling even harder to get attention. It's spent its money marketing such impractical features as 3D displays (which LG has been failing to sell since 2011) and curved screens that (despite enthusiastically supportive promotion by CNET) haven't seen any real enthusiasm from buyers. 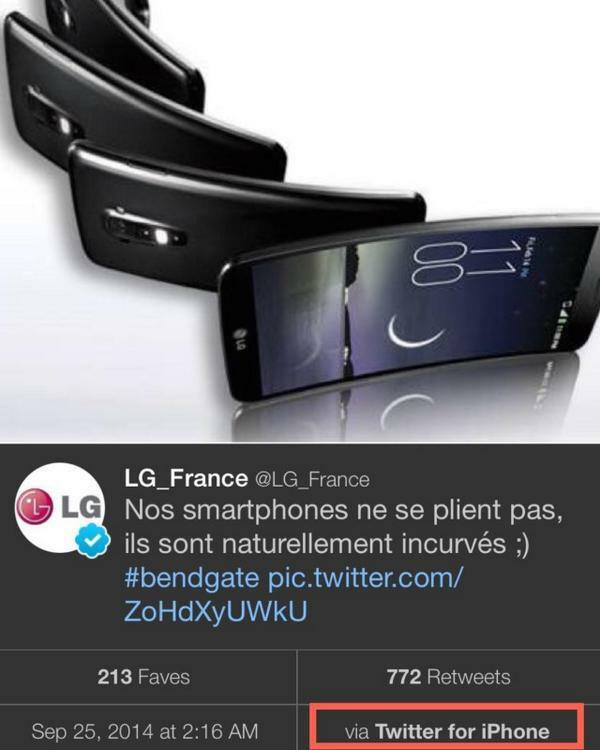 LG's attempt to jump on the BendGate bandwagon to simultaneously take a swipe at Apple and promote its own Flex phone fell flat after the PR agents it used tweeted out its promotional message... from an iPhone. HTC also jumped at the opportunity to take a potshot at Apple, claiming its One M8 flagship was "designed to withstand the most demanding environments. Like your pockets." However, when Consumer Reports tested the 5 inch HTC One M8 against Apple's new phones, it held up worse than either the iPhone 6 or iPhone 6 Plus, which has both a larger display and is significantly thinner (7.1) than HTC's phone (9.35mm). HTC's flagship bent at 60 pounds of force and cracked open at 90, while the iPhone 6 Plus didn't bend until 90 pounds of force, and didn't crack open until the test reached 110 pounds. HTC's ads for the One M8 featured actor Gary Oldman telling people not to listen to the "blah blah blah" of ads but to ask people on the Internet. Which is good advice because Oldman--like Samsung's celebrities and LG's PR team--actually uses an iPhone, too. Some bloggers--and even the general media--seemed to initially imagine that the BendGate story might drive potential iPhone buyers to consider other large phones, sort of the way that AntennaGate was supposed to convince iPhone 4 shoppers to flee toward other devices. However, this didn't happen. iPhone 4 remained the top selling smartphone until it was replaced by iPhone 4S, despite lots of alternatives on the market featuring bigger screens and faster 4G LTE--features many non-technical users in the general public never heard about, thanks in part to the 24/7 coverage of AntennaGate. Instead, they heard lots about Apple's sophisticated antenna testing while observing the dishonest, contradictory and hypocritical responses launched by Nokia, Motorola, Samsung, HTC and others, each of which insisted that they had no problems with their own wireless antennas despite having earlier warned their users about those very issues in their own products. While AntennaGate and BendGate both fixated on hardware, the same sort of disingenuous posturing can focus on software. In 2011, the heads of Google's Android (Andy Rubin) and Microsoft's Windows Phone (Andy Lees) both complained that the new Siri feature on iPhone 4S was a strategically wrong direction and "not super useful," before both companies turned around and scrambled to copy it. In parallel, Samsung specifically targeted iPhone 4S and then iPhone 5 in a social media attack campaign revealed in internal documents subsequently cited as evidence in court. Embarrassed by its own products (which it called "plastic feeling" with "lack of key feature"), Samsung worked to invent and perpetuate the idea among bloggers and even the mainstream media that Apple had run out of "innovation," even as the company also copied every move Apple made. The "lack of innovation" meme reached peak insanity in 2013 before crumbling very embarrassingly. Ironically, last year the biggest hit piece aimed at iPhone 5s was that its new 64-bit A7 was "marketing fluff." Chipmaker Qualcomm was briefly sucked into FluffGate before apologetically distancing itself from the "fluff" comment, made by its chief marketing officer. Even more bizarrely, Samsung's president of System LSI (chip design) Dr. Namsung Stephen Woo publicly told the company's analysts and investors last November (months after Apple revealed and began shipping the first 64-bit A7), "I think we are at the leader group in terms of 64-bit offerings." A year later, not only is Apple still the only mobile phone vendor to be mass producing 64-bit devices, but it's also beating the performance of Qualcomm-based products from Samsung, LG and Motorola, despite using half as many processor cores at slower clock speeds and far less RAM, all of which contributes to longer battery life. Qualcomm and Samsung both appear to be sampling 64-bit chips for smartphones, although "running in a 32-bit mode, in part because the firmware and the current version of Android only support 32-bit operation," according to an article published by PC Mag with the horseshit headline "Apple, Samsung Usher in the 20nm, 64-bit Smartphone Generation." Last year's 64-bit "controversy" was passed around just long enough to inform the public about an esoteric computer science concept that most people buying a smartphone wouldn't know anything about, were it not for Apple's critics trying to convince them that it is not important and that they should pay no heed and that Android would eventually have it, too. We are now at the eighth annual launch of a new iPhone. Each one has been targeted by a similar campaign of fear mongering launched by Apple critics, promoted by competitors and advanced by a media publicists working to create unfavorable buzz. There is a clear pattern of failure in their efforts.